This is long overdue, but I finally had some down time to catch up on my blog posts – this one being one of the ones I’m most looking forward to share about. 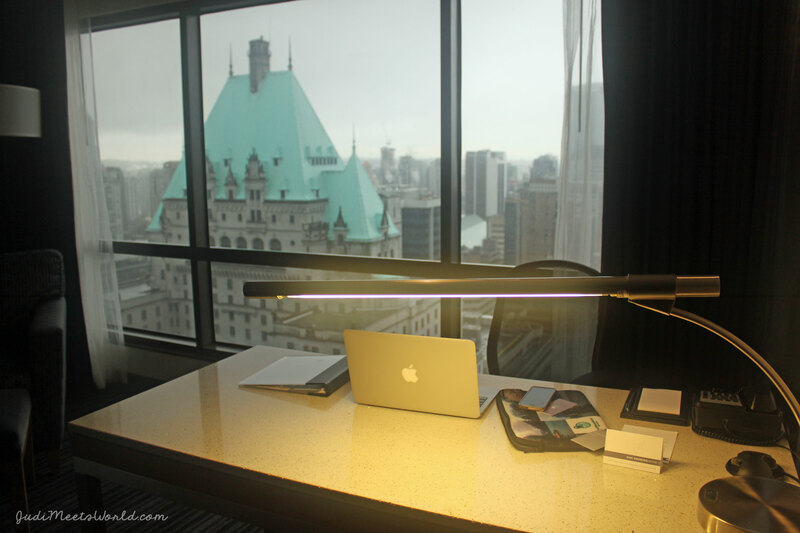 The Hyatt Regency in downtown Vancouver has got to be one of my top hotels – and I’ve been at plenty of hotels during my travels. Read on to find out why. Rate includes buffet breakfast for two, access to the pool, fitness centre, and hot tub. 3 restaurants on site and a Starbucks. Directly beside the Burrard Skytrain stop. Directly outside major bus routes. First off, the staff is among the most courteous. There is a formality in how they conduct business, which gives a really executive mood to the hotel (I appreciated this). I still haven’t gotten over my stay here, and this was a few months ago. I was given a room on the top floor of the Hyatt – a king room with a breathtaking view of Vancouver behind my desk. It made for very whimsical afternoons uploading photos while staring at the always busy, and equally gorgeous downtown lights. The King Suite that I was given was on the floor just below the conference rooms. It was incredibly spacious, with quality toiletries and a bed that made it almost tempting to stay in rather than explore. There is a 24-hour access gym that connects to a rooftop pool and hot tub. The gym had plenty of equipment ranging between cardio, weights, and free weights. There were also some mats and bands. I also enjoyed that the stairwells were painted to look like a forrest and folks were given a climbing challenge to be active. There’s a Starbucks to go which came in handy when I was in a rush to catch a train. I decided to try the in-house dining options at Mosaic Grille for the daily breakfast buffet as well as dinner. It certainly didn’t disappoint. The breakfast buffet came with fresh salmon, incredible entree options (ratatouille for breakfast, anyone? ), and dedicated service. The gentleman that was manning the omelette station even remembered my vegetarian order the 2nd day I came up for breakfast. For dinner, I enjoyed the drink and vegetarian options they had on menu! I’ll let the pictures speak for themselves. Absolutely. Location, location, location. This hotel was easiest for me to get anywhere in Vancouver, since it was close to the Burrard line. It’s also directly across from major bus routes for those not wanting to take a cab. In terms of value, this hotel lives up to its price tag. Major retail outlets are close by, along with lots of exploration options such as paying a visit to Canada Place. I’d stay here again in a heartbeat. You should too.